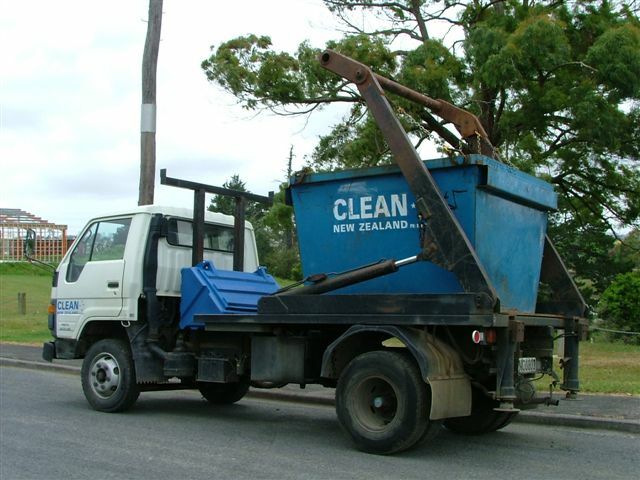 We would like to help you Clean Up New Zealand. Professionals in the area of rubbish removal, we feel we have a commitment to our clients to provide a service of the highest standard. Our reputation speaks for itself, with experience and knowledge in the rubbish business since the 1960's we pride ourselves on years of customer satisfaction. Prices include GST for delivery and bin pick up. We honour all discount coupons as found in the yellow pages. Bins can be hired for the following classes of waste, General Waste, Commercial Waste, Hardfill Waste. NO Hazardous, Dangerous Waste or Polystrene. General Waste includes; Household and Garden Waste, excluding compost, Commercial Waste. It can be organic or inorganic waste. Hardfill waste (also known as Clean Fill) includes concrete, soil, clay, bricks. These products can not be mixed with other wastes including green waste or building waste. If they are mixed, they will be classed as general waste or other waste and charged accordingly. The bins can only be filled to the level of the height of the bin. All overloaded bins must be leveled before removal to comply with the Transport Legislation and Occupational Health and Safety Rules. Once a bin has been placed on a site, the bin is not allowed to be moved without our authority. Placement of the bin is at the discretion of the driver. Damage due to mis-use of the bins will incur financial charges and complaints laid with the appropriate authorities. If you have a problem or queries with our services, please do not hesitate to contact our office. So if you need a hand, contact us with all your rubbish problems. You can also view our Services in more detail on this website.